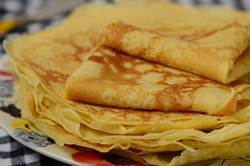 Crêpes (pronounced either "krape" or "krep") are thin French pancakes that have a wonderfully soft and tender texture. They are not that different from an American pancake in taste and texture. I love how you can make the batter ahead of time and store it in the refrigerator for a day or two. But even better, you can make the Crêpes a few days ahead and then just reheat them in a warm skillet without any noticeable loss in quality. For this recipe we are making sweet Crêpes, and there's just so many delicious ways to serve them. My favorite is with a sprinkling of sugar and a drizzling of freshly squeezed lemon juice. But some other great ideas are fruit sauces (blueberry, strawberry, and raspberry), lemon curd, jams (homemade or store bought), maple syrup, chocolate sauce, Dulce de Leche or Nutella with sliced bananas. You can roll Crêpes or fold them into quarters. And while I tend to just eat them with my fingers, you can serve them plated. A Crêpe batter can be made very easily in your blender or food processor. However, you can also make it by hand with a wire whisk (strain the batter if there are lumps). The batter should have the consistency of light cream. Once made, a lot of recipes tell you the batter needs to be chilled (at least an hour although it can be stored up to two days). I more often than not just let the batter sit on the counter for about 30 minutes before making the Crêpes as that seems to be enough time for the gluten in the flour to relax. I think the tricky part of making Crêpes is cooking them. Now, the pan is important, but you don't need a special crêpe pan, a non stick frying pan (8, 9, or 10 inch - 20, 23, 25 cm) is just fine. Heat the pan over medium heat, or until a little batter or water sprinkled on the pan, sizzles just a little. Lightly butter the pan, and then add just enough batter so once you tilt and swirl the pan, the batter forms a thin layer. Now, if you find the batter is setting before you can spread the batter over the surface of the pan, reduce the heat. Conversely, if it doesn't set fast enough, increase the heat. And if you find you have too much batter so that it forms a really thick Crêpe, pour the excess back into your bowl. Because nobody likes a thick crepe that's tough and rubbery. Crêpes Recipe: Place all the ingredients in your blender or food processor and process for about 15-30 seconds or until smooth. Or you can make the batter by hand. In a large bowl whisk the flour with the sugar and salt. In a separate bowl whisk the eggs and then stir in the milk, vanilla extract and melted butter. Make a well in the center of the dry ingredients and then gradually pour in the egg mixture, whisking until combined and smooth. Strain if necessary to remove any lumps. (The batter should have the consistency of light cream.) Cover and let sit at room temperature about 15-30 minutes. Or place in the refrigerator to chill for one hour, or up to two days. After chilling the batter, if it's become too thick, thin it out with a little milk or water. When you're ready to make the Crêpes, heat a 9 inch (23 cm) non stick frying pan or crepe pan over medium heat until a few sprinkles of water dropped on the pan sizzle, just a little. Adjust the temperature as needed. Lightly butter the the pan. Lift the pan from the heat and, using a small ladle or scoop, pour about 3-4 tablespoons of the batter into the center of the hot pan. Tilt and swirl the pan so the batter forms an even layer (does not have to be a perfect circle). Cook until the edges of the Crêpes start to curl and the top looks almost dry (about 1-2 minutes). (The bottom of the Crêpe will have a golden brown lacy pattern.) Flip the Crêpe and continue to cook for about 15-30 seconds or until you have brown spots over the surface. Remove from heat and place on a plate or wire rack. Continue to cook and stack the Crêpes. If you want to keep the Crêpes warm, you can cover them with a clean cloth or a piece of aluminum foil. Or you can place them in a 150 degrees F (65 degrees C) oven. If not eaten right away the Crêpes can be stacked and wrapped in aluminum foil and plastic wrap and stored in the refrigerator for two days or they can be frozen for about one month. Reheat the Crêpes in the oven or in a hot skillet. Makes about 10 to 12 - 9 inch (23 cm) Crêpes.